On Dec 1, 2017, the Sagium social committee launched this year’s holiday celebration with a ginger bread making competition, office decorating contest and kick-off party, all in support of the Calgary Food Bank. Christmas music provided the perfect backdrop for our team of Santa’s helpers to garnish our office with holiday lights and decorations as well as enter their workspace in our annual yuletide contest. An award for most creative space will be voted upon later in December. 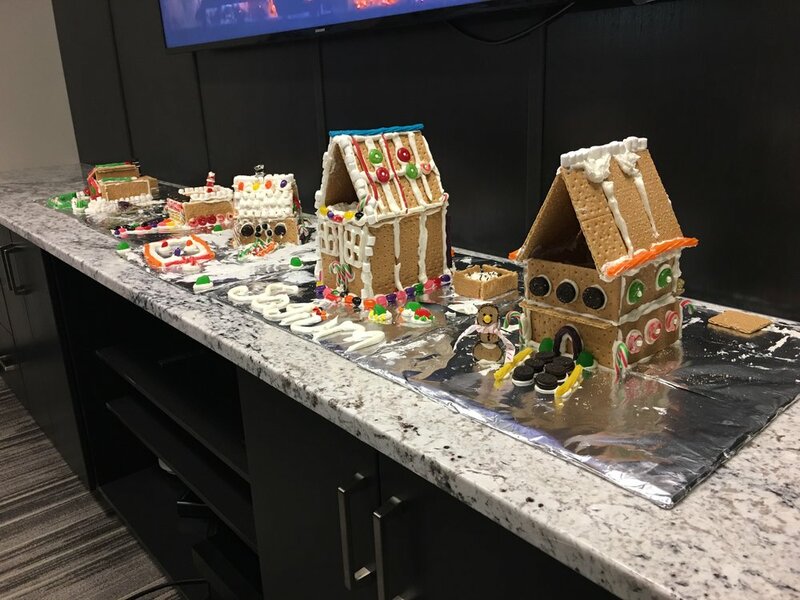 Sagium COO, Mike Grovue commented, “considering the creativity shown in our ginger bread making competition, Sagium may consider opening an architecture division in the new year!” Without a doubt, we have a multi-talented team of competitive individuals in our firm. Our ginger bread houses are proudly on display in our main boardroom. Most importantly, Sagium collected and delivered our first load of groceries this season to the Calgary Food Bank, donating almost 200lbs of assorted food. We are looking forward to making more donations to the Food Bank as the month progresses. Should you wish to make a donation to the Calgary Food Bank, please click here.